"Brawl" redirects here. For the game mode, see Versus Mode. USA box art for Super Smash Bros. Brawl. Super Smash Bros. Brawl (大乱闘スマッシュブラザーズＸ, Great Fray Smash Brothers X), often shortened to "SSBB" or "Brawl", is the third installment in the Super Smash Bros. series published by Nintendo. The game was designed by Masahiro Sakurai, who also created the two preceding Super Smash Bros. games, and was developed by an ad hoc development team consisting of Sora, Game Arts, and staff from other developers, beginning in October 2005. The game uses an engine called Havok provided by an Irish company of the same name. The game released on January 31st, 2008 in Japan, March 9th, 2008 in North America, June 26th, 2008 in Australia, and June 27th, 2008 in Europe. Brawl supports four types of controllers - the Wii Remote alone held horizontally, the Wii Remote and Nunchuk together, the Classic Controller/Classic Controller Pro, and the GameCube controller. Up to four players can engage in local multiplayer battles at any given time with any combination of controllers, while Brawl also supports online play through the Nintendo Wi-Fi Connection, the first game in the series to do so. While Brawl continues to include the tournament-like "Classic" and "All-Star" single-player modes, Melee’s Adventure Mode has been replaced with The Subspace Emissary; a much more extensive side-scrolling beat-'em-up mode featuring both the playable characters and many enemies specifically created for the game. The resulting mode includes an involved plot and numerous pre-rendered cutscenes, as well as some platform game elements during gameplay. Following the trend set by earlier games in the series, Brawl showcases a wide selection of characters from Nintendo and its second parties, setting them to fight in several different types of matches. Unlike its predecessors, however, Brawl also includes two third-party characters in Solid Snake and Sonic the Hedgehog. In total, the number of playable characters was increased from Melee's 25 to 35 (or 39, if including Sheik and Zero Suit Samus separately from Zelda and Samus, and counting Squirtle, Ivysaur, and Charizard individually rather than grouped as Pokémon Trainer). Most of the game's musical score is made up of newly-arranged versions of pieces that originated in earlier video games starring the characters featured in Brawl, with the remainder taken directly from the original games. The new arrangements were composed in a collaboration between 38 renowned video game composers and has been critically acclaimed for its representation of different generations in gaming history. The limited edition release of Super Smash Bros. Brawl came inside an extra cardboard sleeve depicting all of the characters available by default, and came with two postcards, providing a biopic on Zero Suit Samus and Zelda, giving a short summary of them, and showing images of their special moves. Following the release of the game in Japan, a bug was discovered in the game. This bug causes the game to display an error message when it starts, however, players can close the error message and play the game as usual. There has since been a replacement program. The game requires 128 free blocks of memory in the Wii System Memory. No data, except some vault data, can be copied to an SD Card or transferred onto another Wii. If the player does not create a save file when they start, he or she will not be able to play via Nintendo Wi-Fi Connection and vault data will not be saved. As of May 20, 2014, the Nintendo Wi-Fi Connection has been shut down therefore making it impossible for anyone to play Brawl online without hacking. 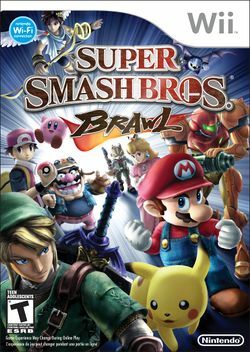 Brawl received universal acclaim, with praise centered on its entertainment value despite issues relating to its content loading times, and its musical score was lauded for its representation of different generations in gaming history. The game has sold 13.29 million units as of 2008, making it the eighth best-selling Wii game of all time. In the opening movie of Super Smash Bros. Brawl, the cinematic utilizes scenes from The Subspace Emissary, along with a few selections of Versus Mode matches, as opposed to featuring unique footage in the manner of the game's predecessor, Super Smash Bros. (Super Smash Bros. Melee used footage from its E3 trailer). Entire cast of playable characters; excluding Zero Suit Samus and Sheik, the transformations of Samus and Zelda, respectively. The character selection screen of Super Smash Bros. Brawl (all characters unlocked). The cast of 35 playable characters (39 if Sheik and Zero Suit Samus are included and the three different Pokémon of the Pokémon Trainer are treated as individual characters) includes 20 (21 including Sheik) returning veterans from Melee and 15 newcomers (18 including transformations). Of these, 21 are starter characters (25 if Sheik and Zero Suit Samus are included and the three different Pokémon of the Pokémon Trainer are treated as individual characters) and the other 14 need to be unlocked. Many of the returning characters have been updated or refined since their last appearance, either in terms of appearance, fighting capabilities, or both. For example, Link and Fox McCloud have taken on new designs from more recent titles, while Samus Aran has gained the ability to change into a new form, Zero Suit Samus, by using her Final Smash or by the player pressing a certain button after picking Samus and before picking a stage. Five characters do not return from Melee: The Legend of Zelda's Young Link, Pokémon's Mewtwo and Pichu, Fire Emblem's Roy, and Mario universe's Dr. Mario. Of these, only Mewtwo was not a moveset clone, and it is assumed to have been the furthest into development of the cut characters. Except for the Mario series, each series gained new characters added to the roster: Toon Link for The Legend of Zelda, Lucario and Pokémon Trainer (who controls Charizard, Squirtle, and Ivysaur) for Pokémon; and Ike for Fire Emblem. Several franchises already represented in the Super Smash Bros. series gain additional character slots, with the Kirby universe the biggest gainer, as both King Dedede and Meta Knight make their playable Super Smash Bros. debuts. Otherwise, EarthBound sees Lucas join, the Star Fox franchise adds Wolf, and the Donkey Kong universe adds Diddy Kong, while Metroid has Samus's aforementioned "Zero Suit" form, which originally debuted in Metroid: Zero Mission, added as a transformation for its sole character. New character slots which go to Nintendo series previously unrepresented include Pit, the first appearance of the Kid Icarus series since the 1991 Game Boy game Kid Icarus: Of Myths and Monsters; Wario, originally a Mario spin-off but long launched into a franchise of his own; Captain Olimar from the Pikmin series; and the NES accessory R.O.B.. Finally, main protagonist Solid Snake of the Metal Gear franchise, and Sonic the Hedgehog from his eponymous series become the first third-party characters to appear in a Super Smash Bros. game. Master Hand and Crazy Hand are fought in Classic mode while all the others are fought in the Subspace Emissary. Master Hand, Crazy Hand, Galleom, Duon and Tabuu are exclusive to the Smash universe while the others come from other Nintendo universes. The number of Trophies, statuettes of Nintendo characters and objects which can be collected in-game, was almost doubled from Melee. A related feature was the introduction of stickers, small pieces of Nintendo artwork which can be picked up from offline and online matches, along with the Smash Service's "Spectator Mode." Stickers also make an appearance in the single-player and multiplayer modes, such as the Stadium mode. Stickers also act as a sort of enhancement to the characters' abilities when using attacks in Adventure Mode: The Subspace Emissary.. Through the Trophy Hoard and Sticker Album, players can place trophies and stickers onto virtual backgrounds and take snapshots, all of which is recorded into the Wii's internal hard drive or onto SD cards depending on the player's choosing. From this point, these virtual items can be sent to other players via Nintendo Wi-Fi Connection, "WiiConnect24". By completing stages in Classic Mode, All-Star Mode and The Subspace Emissary, coins can be earned. The coins can be used to play the Coin Launcher to win more stickers or trophies, to "pay" for Continues in Classic and All-Star Mode, to bet on the outcome of Spectator Mode matches and to choose stages in online play. Brawl introduces "Masterpieces", time-limited Virtual Console game demonstrations, to the Super Smash Bros. series. The international release has twelve such games available, each of which features one or more of the playable characters from Brawl. Seven games are available for play to begin with, with five more unlockable by completing Challenges, which range from Mario's debut in Donkey Kong to the critically acclaimed late Nintendo 64 title The Legend of Zelda: Ocarina of Time. The time-limits on each individual play last between 30 seconds (Donkey Kong), to five minutes (Ocarina of Time). The Japanese release has two additional Masterpieces not included in the international releases — the SNES games Mother 2 (known as EarthBound in its US release) and Fire Emblem: Monsho no Nazo. On May 22, 2007, Sakurai revealed a list of 38 composers providing the musical score for the game. In his accompanying statement, Sakurai said that he had asked the composers, who come from a variety of companies and have written music for first, second, and third-party games, "to listen to an elite selection of Nintendo music and arrange several of their favorite songs." Each of the game stages have multiple musical tracks which players can listen to using the new "My Music" feature, including some songs that were taken directly from other games without any modification or special arrangement. This feature also allows the player to adjust the frequency of how often a music track is played on a given stage. Collecting CDs expands the range of music available. Brawl features many stages that can be fought on. Most of them are new, but a few return from Melee. On some stages, such as Shadow Moses Island, Smash Taunts can be performed. Brawl also has an option to create custom stages with the Stage Builder. At the pre-E3 2005 press conference, the president of Nintendo, Satoru Iwata, announced the next installment of Super Smash Bros. was not only already in development for their next gaming console, but would be a launch title with Wi-Fi compatibility for playing online. The announcement was unexpected to the creator of the Super Smash Bros. series, Masahiro Sakurai. Back in 2003, he had left HAL Laboratory, the company that was in charge with the franchises' development and was never informed of this announcement despite the fact shortly after resigning from the company, Iwata said if a new game was to be made, he would be in charge. It was not until after the conference Sakurai was called to Satoru Iwata's room on the top floor of a Los Angeles hotel where he was told by Iwata, "We'd like you to be involved in the production of the new Smash Bros., if possible near the level of director". Although originally announced to be a launch title, Sakurai stated "I decided to become director. And as of May, 2005, I was the only member of the new Smash Bros. development team". Development of the game never actually started until late 2005, and just for its production, Nintendo opened a new office in Tokyo at the beginning of October 2005. Nintendo also enlisted outside help from a company who, at that point in time, just finished development of a major title. Sakurai also stated that these people had spent excessive amounts of time playing Melee. The team had access to all the original material and tools from the development of Melee, courtesy of HAL Laboratory. Brawl was absent from Nintendo's Wii showing at its 2006 Pre-E3 press conference. The next day, on May 10, 2006, its first official trailer was unveiled at E3 and at the After-Hours Press Conference, Nintendo officially revealed the game under the name of Super Smash Bros. Brawl. In an interview with IGN, Sakurai said the Wii's motion sensing features might not be included because, "we found that trying to implement too much motion-sensory functionality can get in the way of the game." As far as Wi-Fi play is concerned, Sakurai stated his plan was to include Wi-Fi connection compatibility and online functionality, he goes on to say "one of the primary reasons Super Smash Bros. Brawl was created was that Nintendo, when taking Wii online, wanted to have Smash Bros. to do that". However, as stated on the Japanese version of the Smash Bros. website, "there would be many hurdles to cross," and an online ranking system is unlikely to be implemented. During a test play between Sakurai and Hideo Kojima, creator of the Metal Gear series, Kojima stated that the game felt complete and that Nintendo "could put it out right now and it would sell millions of copies." 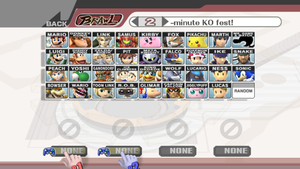 Starting May 22, 2007, the site had updates every weekday until shortly after Brawl's release. Throughout October 18-22, 2007 at the first Entertainment for All Expo show in Los Angeles, California, Nintendo hosted a Super Smash Bros. Brawl tournament. On October 11, 2007, George Harrison of Nintendo of America announced that Brawl would be released on February 10, 2008 in North America. The North American version of the game was later delayed a second time to March 9th. Sakurai stated that he did not want to emphasize Japan-only characters; in Brawl's cast, only Lucas had not appeared outside of Japan (although Marth had only previously only appeared internationally in Super Smash Bros. Melee, rather than his home franchise). Sakurai also stated there would be no more than three third-party characters; these characters were Solid Snake and Sonic the Hedgehog. The inclusion of Konami-created character Solid Snake may seem to conflict with the Super Smash Bros. paradigm — to only include characters from games made by Nintendo and its second parties — but Sakurai said Hideo Kojima "practically begged" for Snake to be included in Melee, which did not happen because the game was too far in development. This in turn led to his appearance in the following game instead. Similarly, Lucas from Mother 3 was intended to be used in Melee, but was left out because Mother 3 was delayed. Japanese fans were asked to submit their desired characters and musical themes via a forum on the game's official Japanese site, with some possibly appearing in the game. Likewise, fans from other countries were asked to submit ideas on Nintendo's official forums. Suggestions were no longer being taken as of June 9, 2006. In August 2006, Sakurai and Miyamoto stated that Nintendo was negotiating rights to other third-party characters. The most requested third-party character, Sega's Sonic the Hedgehog, was announced to be in the game on October 10, 2007. Several different trailers for Brawl were released before the game came out. The original trailer was shown at E3 2006 on May 11, 2006 and revealed Pit, Meta Knight, Zero Suit Samus, Wario and Solid Snake as new playable characters, alongside the return of Mario, Link, Samus, Pikachu and Kirby. A second trailer was shown at the Nintendo World 2006 convention in December, and revealed Fox's return as a playable character. A third trailer was shown at the October 10, 2007 Nintendo Press Conference, which revealed Sonic as a playable character. A final trailer showcasing Brawl's adventure mode, the Subspace Emissary, was released on Friday, December 21, 2007. This trailer revealed that Ike and the Ice Climbers would appear in this mode, among other things. Super Smash Bros. Brawl received critically positive reviews and sold successfully. In the United States, the game sold 874,000 units on launch day and 1.4 million units in its first week to become the fastest-selling video game in Nintendo of America's history, according to Nintendo. The game has sold 10.79 million units worldwide as of March 2012 according to Nintendo, which makes it the best selling fighting game of all time. Super Smash Bros. Brawl is the 8th best selling game for the Wii, and sold 13.29 million units worldwide, as of September 30, 2018. Brawl currently holds an aggregate review score of 92.84% on Gamerankings and a score of 93% on Metacritic. Despite this, British publication NGamer received criticism for awarding a 93% rating to Brawl, with readers deeming the score too low, especially in comparison to Official Nintendo Magazine's 95% rating. Brawl has reviews with ratings equal or slightly better than Melee. The game's multiplayer was received excellently, but single player, while noted as superior to Melee's, was still only average. However, since 2013 (five years since its release), Brawl's representation in tournament play has decreased. This is because many changes from Melee likely intended to make Brawl more beginner-friendly have resulted in a less dynamic metagame that gradually became less successful with players and spectators. Arguably the most controversial change is the added ability to act during hitstun, which reduces combo potential for characters; other factors include the generally slower pace of gameplay, the decreased falling speeds, the removal of mechanics such as L-canceling and wavedashing, introduction of random tripping, and very polarized character balance (attempts to universally ban overcentralizing characters such as Meta Knight have proven unsuccessful). Because of these changes, Brawl has a smaller tournament scene than both its predecessor and successor game, although it still appears in some major cross-game tournaments. Generally, Brawl's gameplay engine functions much like Super Smash Bros. as the game plays slower: every veteran has a slower falling speed and gravity, L-cancelling has been removed, dashing barely increases forward momentum in midair, and characters must wait a slightly longer amount of time before being able to meteor cancel. As a result, many veterans were generally heavily nerfed due to the decreased or removed abilities while a few, particularly the low and bottom tiers of Melee at the time of Brawl's release, generally benefited from the new physics and were buffed. The air dodge no longer involves characters shifting in a direction; instead, characters continue on whatever path they were moving before the air dodge without inducing the helpless state. This gives characters more options in the air, but makes wavedashing impossible. The amount of time a launched character is forced to stay in hitstun is significantly decreased; it can be cancelled with an air dodge or an aerial after a short amount of time, making true combos nonexistent, and can even be done to the point of slowing down or even cancelling their momentum while still suffering from knockback, allowing characters to survive for much longer than before. Some characters now have unique meteor cancel windows: while it is 25 frames for most characters, those with tether recoveries only (such as Ivysaur) have a smaller delay in meteor canceling, while characters that use wings for multiple jumps (such as Meta Knight) must wait for longer. Additionally, attempting to meteor cancel with a jump before this window of time will result in a 40-frame penalty where the character cannot meteor cancel. The knockback formula has been changed to include a character's gravity. This results in a character's falling speed having a much smaller effect on their vertical endurance. An example can be seen in Fox: despite having the highest accelerated falling speed, he has the 5th worst vertical endurance out of the cast, unlike in Melee, where his vertical endurance was the 6th best, as his high gravity now causes him to sustain more knockback. The window for dash-dancing is so small it loses almost all its usefulness. Tether recoveries are generally less useful than the wall-grappling they replaced; they only aim for ledges as opposed to walls, and can be very easily edgehogged, however they do not render the user helpless except for a few special move tethers. Characters must wait a short amount of time before being able to move after grabbing a ledge. Shieldstun has been drastically decreased, with an increased perfect shield window. It only takes 7 frames to shield drop, making the game more defensively-focused. There is a landing lag glitch on not all but several characters, that causes the character when they land to be inflicted with the landing lag of a helplessness-inducing special move, if they grabbed the edge during the move, or after using the move before landing. Characters can grab a ledge with their back facing it, and most recovery moves (though not all of them) also cancel for the character to grab the edge, making recovery easier and more flexible, as well as lowering the effectiveness of attacks that turn the opponent around, such as Mario's Cape. Additionally, using any up special move (with two exceptions) no longer expends the character's double jump, allowing characters to use it after an up special move if they are hit out of it in the air without having used the double jump prior. Edge teching is no longer possible, as well as ledge canceling attacks. Characters can now air dodge while tumbling, so teching itself is harder to perform, and has become generally less useful due to the reduced hitstun and momentum canceling. "Pain yells" are reliant on how long a character is in stun (instead of being reliant on how much knockback the character receives), and each character has two (or one in Ness's and Lucas's case) or none at all. Characters no longer have a single noise for being KO'd horizontally or falling; each character now has two (this is most notable with Pit and Ivysaur) or again, none at all. Additionally, most characters have multiple noises for their aerial attacks and tilts (all of them are shared; Donkey Kong, for example, can make the same noises when executing his down tilt as when executing his up aerial). Characters only make one sound when doing smash attacks (Mario's "Yeeha!" heard when he does his up smash is among the easiest to notice). Visually, most characters appear much less saturated and have more realistic, detailed textures, even if it doesn't match with their appearances in other games. This is easily noticeable in Mario, Luigi, Peach, Yoshi, Kirby, Jigglypuff and the Ice Climbers. Buffering implemented: characters can now perform actions by inputting them at least 10 frames before they can actually be executed. Spikes no longer exist, as the trajectory range for a meteor smash has been increased, and all attacks with a downwards angle fall into this range. The footstool jump allows characters to bounce off of other characters' heads while sending the opponent downward; it acts like a meteor smash, though the footstool jump is not a true meteor smash. Characters knocked down on the floor now enter a flopping animation upon hit by a weak attack, which does not give them any invincibility frames until they can get up, enabling locks. Crouching cannot cancel dashes, and crouch canceling no longer reduces knockback. Smash attacks are easier to angle, as the player can now just hold up or down during the forward smash to angle it. Characters now conserve forward momentum when dash grabbing opponents. Pummels now deal variable damage from 1% to 3% depending on the character, rather than all dealing 3%, and have variable speeds depending on their strength: while characters like Mario pummel as slow as in the previous game while dealing more damage per pummel, others like Kirby can pummel very quickly, dealing less damage per pummel. Some characters can crawl, while others can glide or wall cling, and every character can swim in water instead of falling through it. Some characters have the dash attack canceled up smash that improves their approach. All characters now have a Final Smash. Characters can now randomly trip, and they have a floor attack for when they do so. Some characters can grab release-combo other characters. CPUs, while still having exploitable flaws, have gained an AI increase in general, choosing more alternatives with attacks and having quick dodging techniques of 1 frame reaction, among other improved behaviors. Grabbing a character does not restore their midair jump(s). Short hopping is at least 1 frame easier for all characters compared to Melee. Smash Taunts do not end if the user flinches; they have to be KO'd to end it early. Up smashes can be performed while running without needing to jump cancel, known as a slide smash. Characters can now pivot grab. Glancing blows no longer deal damage, and a few sparks will show up to indicate one. All characters now have three taunts instead of one, and have unique on-screen appearances, which return from the original Super Smash Bros.. Items can now be grabbed during dash attacks, aerial attacks and air dodges. Shrinking and growing animations have been added for every character. Players can now configure personalised controls for names. Bonuses have been removed, with only a few being awarded at the end of Classic and All-Star modes depending on the player's progress. Outside of the main game, players can build custom stages and save snapshots and replays. The Sound Test is now available at the start. However, certain sounds and music have to be unlocked. Melee's Adventure Mode has been replaced by The Subspace Emissary. Event matches have selectable difficulties. Target Test is now known as "Target Smash!! ", and it now has selectable difficulties, though there are now only five stages for all characters, rather than every character having their own stage, like in the previous two games. The Home-Run Contest puts a temporary shield around the platform. All of the four modes above can also be played in co-op, and players could also play online in various modes. Special Brawls' effects can now be combined rather than all appearing in different modes. Other special effects have also been added. Collectible stickers have been added, which can be collected on matches to then be used in the Subspace Emissary. The Lottery for trophies has also been replaced with the Coin Launcher. Players can now take snapshots of both trophies and stickers. In one-player game modes, the C-stick acts the same as in multiplayer modes: instead of zooming, it is used as how the player has configured it, the default function being uncharged smash attacks. Any wins, losses, KOs, and other things performed by CPU characters do not count in the records. Super Smash Bros. Brawl as featured on the cover of Nintendo Power issue #222. The Brawl menu was designed to be very similar to the menu in Kirby Air Ride, including the Challenges Checklist. Interestingly, Air Ride's menu uses deeper versions of the confirm and toggle sound effects from Melee's menu. Super Smash Bros. Brawl is featured on the cover of Nintendo Power issue #222 (Pictured above). Unlike most Wii games, Super Smash Bros. Brawl comes in a dual-layer disc due to the large amount of data used for the game. Some older Wii consoles have trouble reading the disc, so various Nintendo branches around the world offer a free cleaning program for affected Wii consoles. Brawl is the only game in the entire series to cut a Mario universe character (Dr. Mario), as well as the only game in the series to not include a new Mario universe character, discounting Wario and Diddy Kong, who despite technically being a part of the Mario universe and appearing in several Mario games, are considered to be from the Wario and Donkey Kong series, respectively. Not counting the Virtual Console, Brawl is the only Wii appearance for Sheik, Wolf, Captain Falcon, Ness, Lucas, Marth, Ice Climbers, and Snake. Brawl was also the first (but not last) appearance on the Wii for Zero Suit Samus, Kirby, Meta Knight, King Dedede and Olimar. Brawl is also the only game in the series not to feature stages from Super Smash Bros..
Before Super Smash Bros. Ultimate, Brawl had the most unlockable characters out of any other Smash Bros. game, with 14 characters needing to be unlocked. It also has the most unlockable stages, with 12. Brawl introduces four Pokémon series newcomers, which is more series newcomers than any other universe has in the game. It is tied with The Legend of Zelda series, which introduced four newcomers in Melee. By coincidence, the Nintendo Direct on March 8, 2018, which announced Super Smash Bros. Ultimate for the Nintendo Switch, aired only one day before the 10th Anniversary of Super Smash Bros. Brawl in the US. When not including DLC of Super Smash Bros. for Wii U, Brawl introduced the most new stages with 31. Brawl is the only Smash game to have no characters debuting in it recieve a new Echo Fighter in Ultimate, as Dark Pit returns from Super Smash Bros. 4 as Pit's Echo Fighter. ↑ Sakurai, Masahiro. Iwata Asks: Super Smash Bros. Brawl (Transcript). Retrieved on 2008-04-11. ↑ Super Smash Bros. Brawl at Nintendo Australia. Nintendo (2006-05-12). Retrieved on 2007-06-20. ↑ Upcoming Nintendo titles for Wii and Nintendo DS across Europe. Nintendo-Europe. Retrieved on 2007-07-11. ↑ "Look who is attending the Brawl! ", Nintendo, 2007-10-10. Retrieved on 2007-10-10. ↑ Four Kinds of Control. Smash Bros. DOJO!!. Smashbros.com (2007-06-08). Retrieved on 2007-06-08. ↑ Sakurai, Masahiro. Foreword. Smash Bros. DOJO!! (Internet Archive). Retrieved on 2007-11-11. ↑ name="four control">Four Kinds of Control. Smash Bros. Dojo!! (2007-06-08). Retrieved on 2007-06-08. ↑ Sakurai, Masahiro (2007-11-16). Wi-Fi Play. Smash Bros. DOJO!!. Retrieved on 2008-04-22. ↑ 11.0 11.1 Sakurai, Masahiro ("May 22 Tue. 2007"). The Musicians. Smash Bros. DOJO!!. Retrieved on 2011-01-16. ↑ Hudak, Chris. Super Smash Bros. Brawl Review at Game Revolution .. Game Revolution. Retrieved on 2008-04-21. ↑ 13.0 13.1 Trophies. Smash Bros. DOJO!!. Smashbros.com (2007-09-24). Retrieved on 2007-10-24. ↑ 14.0 14.1 Stickers. Smash Bros. DOJO!!. Smashbros.com (2007-08-15). Retrieved on 2007-10-24. ↑ 15.0 15.1 My Music. Smash Bros. DOJO!!. Smashbros.com (2007-09-07). Retrieved on 2007-10-28. ↑ Classic. Smash Bros. DOJO!!. Smashbros.com (2007-10-30). Retrieved on 2007-10-30. ↑ Casamassina, Matt (2005-05-17). E3 2005: Smash Bros. For Revolution. IGN. Retrieved on 2006-05-03. ↑ 19.0 19.1 Casamassina, Matt; Peer Schneider (2006-05-10). E3 2006: Super Smash Bros. Brawl. IGN. Retrieved on 2006-08-01. ↑ Miller, Ross (2006-06-05). Sakurai reveals new Smash Bros. Brawl details. Joystiq. Retrieved on 2007-06-21. ↑ Dormer, Dan (2007-04-27). Kojima's Played Super Smash Bros. Brawl. 1up.com. Retrieved on 2007-06-21. ↑ Wirgler, Matthew (2007-10-09). Super Smash Bros. Brawl and Mario Galaxy Playable at E for All. Advance Media Network. Retrieved on 2007-10-21. ↑ Casamassina, Matt (2007-07-11). Nintendo E3 2007 Press Conference. IGN. Retrieved on 2007-07-11. ↑ Nintendo Conference Fall 2007 (mpg). E-news.co.jp (2007-10-10). Retrieved on 2007-10-11. ↑ Smash Release Date Confirmed. Retrieved on 2007-10-14. ↑ Brawl Delayed Again (2008-01-15). ↑ 27.0 27.1 Klepek, Patrick (2006-06-05). Super Smash Bros. Brawl Details. 1UP. Retrieved on 2007-09-13. ↑ Mcwhertor, Michael (2006-05-11). E306: Super Smash Bros. Brawl Q&A. Kotaku. Retrieved on 2007-09-18. ↑ 速報スマブラ拳: Ness (Japanese). Nintendo. Retrieved on 2007-10-21. 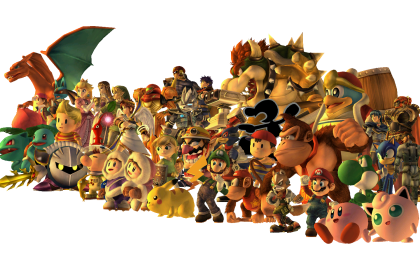 ↑ E3 2006: Fans Asked to Fill Smash Bros. Roster. IGN (2006-05-11). Retrieved on 2006-05-11. ↑ Sonic The Hedgehog. Smash Bros. DOJO!!. Smashbros.com (2007-10-10). Retrieved on 2007-10-10. ↑ Mielke, James (2008-03-07). Super Smash Bros. Brawl Review. 1UP.com. Retrieved on 2008-05-16. ↑ Edge staff (April 2008). http://www.next-gen.biz/index.php?option=com_content&task=view&id=9575&Itemid=51 Super Smash Bros. Brawl Review, 84–85. ↑ Bramwell, Tom. Eurogamer Super Smash Bros. Brawl Review. Eurogamer. Retrieved on 2008-03-27. ↑ Gray, Brian. "Famitsu Gives Smash Bros. Brawl a Perfect Score", 1up.com, 2008-01-16. Retrieved on 2008-04-27. ↑ GameTrailers Super Smash Bros. Brawl Review. GameTrailers. Retrieved on 2008-03-09. ↑ Casamassina, Matt. IGN Super Smash Bros. Brawl Review. IGN. Retrieved on 2008-03-04. ↑ Castle, Matthew. Ngamer — Review: Super Smash Bros. Brawl. NGamer. Retrieved on 2008-02-26. ↑ Slate, Chris. "Simply Smashing", Nintendo Power, Future US, March 2008, pp. 82–83. ↑ Mathers, Martin (2008-06-26). Wii Review: Super Smash Bros.. Official Nintendo Magazine. Retrieved on 2008-10-02. ↑ Super Smash Bros. Brawl (wii: 2008): Reviews. Metacritic. Retrieved on 2008-04-23. ↑ Super Smash Bros. Brawl Reviews. Game Rankings. Retrieved on 2010-10-25. ↑ TopTenReviews – Super Smash Bros. Brawl. TopTenReviews. Retrieved on 2008-07-09. ↑ Gamespot: Best Fighting Game of the Year. GameSpot. Retrieved on 2009-02-23. This page was last edited on April 16, 2019, at 09:33.